When it comes to family vacations, I look for a beach resort where the property offers an experience in itself, rich with amenities. This is, by far, my favorite way to use points with a family. Yes, staying at a nice high-end hotel in a city is great, but typically it is just a place to rest my head. The majority of my time is spent exploring the city — away from the hotel so I don’t get as much value from that type of hotel redemption. With two young kids, a relaxing beach vacation with a pool, kids activity center and food easily at our disposal is just about perfect. The main problem with many Caribbean and Mexican resort properties is that the cost of food can really add up. It makes me cringe when I see my bill at the end of the trip, knowing that the kids probably didn’t eat half of what we purchased. Feeding a family of four for breakfast, lunch, dinner, snacks (and, of course, drinks for the adults) is no joking matter! My “free” vacation using points and miles does not end up anywhere close to free. This is when using your points at an all-inclusive property comes in handy. There are many properties where all-inclusive is the only option and is actually included when redeeming your points. While some properties charge more after the first two adults, the cost is minimal when you take into consideration that you could potentially have a $0 bill at the end of your vacation. Here are eight properties in the sunny Caribbean and Mexico where your family can use your hotel points at an all-inclusive resort. The Hyatt Ziva Rose Hall is located just 15 minutes from the Montego Bay airport and that gives you a quick jump-start to your vacation. The resort includes two separate pool areas — one for relaxation and one with many pool activities, including a swim-up bar. You can participate in anything from dance lessons on the pool deck to water Ping-Pong. There are many beach activities as well, all included, such as kayaking, Boogie boarding and snorkeling. There is also a sister resort nearby, the Hyatt Zilara Rose Hall, which is Hyatt’s adults-only resort. Hyatt Ziva Rose Hall pool. Photo courtesy of Hyatt Hotels. There are eight choices for dining, including a buffet, Italian restaurant, Asian restaurant, steakhouse, a beach shack and beach grill, a pub, deli and beachfront grill. That is on top of four different bars for a variety of drinks and beach cocktails. 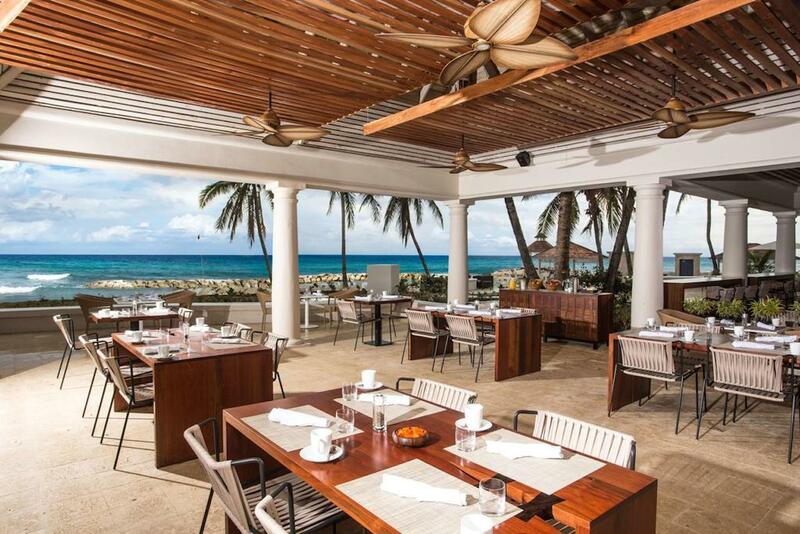 Hyatt Ziva Rose Hall beachfront dining. Photo courtesy of Hyatt Hotels. The kids club is definitely a highlight, where there is a game room, playground and many other activities throughout the day. You can drop off your kids, ages 4 to 12, throughout the day for as long as you want. During this time, parents can visit the spa, fitness center or just relax on the beach. This property costs just 25,000 World of Hyatt points per night for double occupancy. Any extra adult or child will cost 12,500 points per night, although kids 2 and under stay for free. During peak dates, this hotel can easily cost well over $500 a night (for two adults), so this redemption can get you more than 2 cents per point. You can earn World of Hyatt points with the World of Hyatt Credit Card or transfer Chase Ultimate Rewards to your Hyatt account at a 1:1 ratio from cards such as the Chase Sapphire Reserve or Chase Sapphire Preferred Card. The Hilton Rose Hall Resort & Spa, also in Montego Bay, offers not only a private beach and multiple pools, but also an awesome water park. The Sugar Mill Falls Water Park is included for all guests. It features a 280-foot slide and a lazy river. This is a huge perk of the resort as it is the only all-inclusive resort in the Caribbean that has a water park where you can use your hotel points. This resort also includes tennis (and tennis lessons), a kids club, a Teen Zone and nightly entertainment. Hilton Rose Hall Resort & Spa water park. Photo courtesy of Hilton Hotels. There’s a ton of dining options, from casual to fine dining. The buffet also features a late-night snack open till 2am. There are bars, a coffee shop and even a swim-up bar offering food and drinks. Unfortunately though, room service is not part of the all-inclusive experience. For my family, this would be the one downside of visiting this property. I personally like ordering room service while the kids are getting ready for the day and I wouldn’t want to pay for it since you can get the same food for free elsewhere on the property. 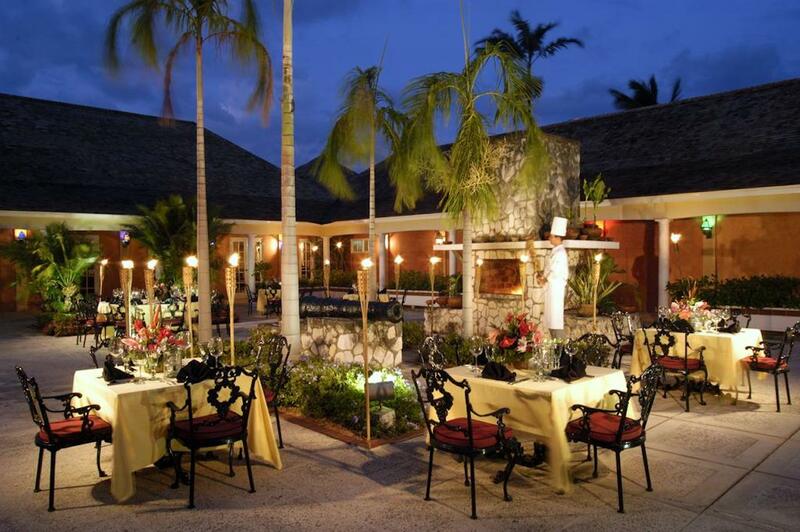 Hilton Rose Hall Resort & Spa dining. Photo courtesy of Hilton Hotels. A free night at this property ranges between 63,000 to 70,000 Hilton Honors points per night for a standard room. Many reports also show that when staying on a points reservation, they were not charged any additional fee for kids in the room. This could be a huge savings when staying as a family. Also, if you have Silver, Gold or Diamond Hilton status, you’ll receive your 5th night free when redeeming points. Having status with Hilton is quite easy since any of their co-branded credit cards — such as the Hilton Honors American Express Ascend Card, Hilton Honors American Express Aspire Card and Hilton Honors American Express Card — will give you automatic elite status. The Holiday Inn Resort Montego Bay is the third all-inclusive property in Montego Bay where you can use your hotel points. Although you might not equate a Holiday Inn property with a nice resort location, this hotel receives great reviews. And, many travelers with IHG Platinum status have even reported being upgraded to a one-bedroom suite. This property also went through a facelift (and a name change) a few years ago, with many renovated rooms. This property is on its own private island and features crystal clear water. There are kids activities for the little ones and a spa for the adults. This is also one of the only hotels on this list where you’ll find a casino. 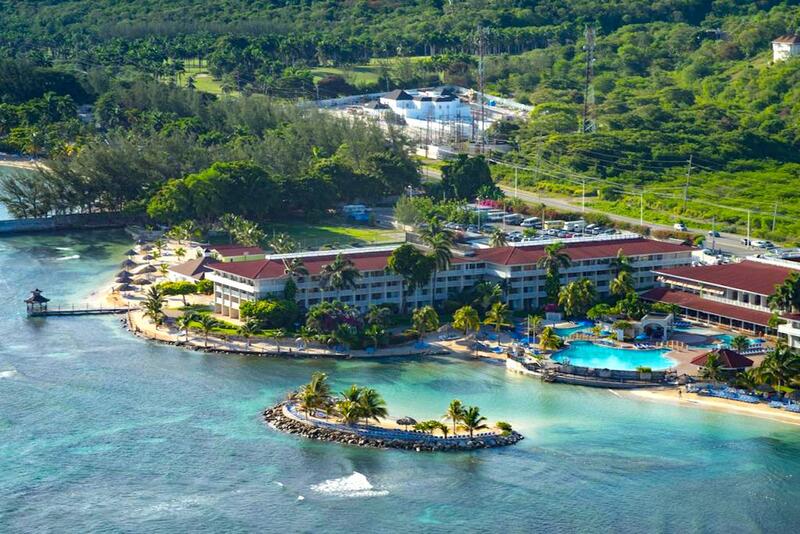 Holiday Inn Resort Montego Bay. Photo courtesy of Holiday Inn Hotels. This resort will cost you 50,000 IHG Rewards Club points a night for double occupancy. This is actually one of the few properties where kids 12 and under stay for free — no extra points or cash required so you can really maximize your IHG Rewards Club points from cards such as the IHG Rewards Club Premier Credit Card. If you don’t have enough IHG Rewards Club points, you can transfer Chase Ultimate Rewards to your IHG account or wait for a really good sale on points. Through April 2019, you can even use your legacy free night certificate that you receive from the IHG credit card. Starting in April 2019, the free night certificate will be capped at properties costing 40,000 points or less, which means this hotel will eventually be excluded. At more than $300 per night during peak dates, this is a great redemption where all of your food and activities are included. The Hyatt Ziva Cancun probably wins the award for the nicest all-inclusive property at which you can use your points. And, its suites — like the Pyramid Suite category — are especially nice for families that need a bit more space. 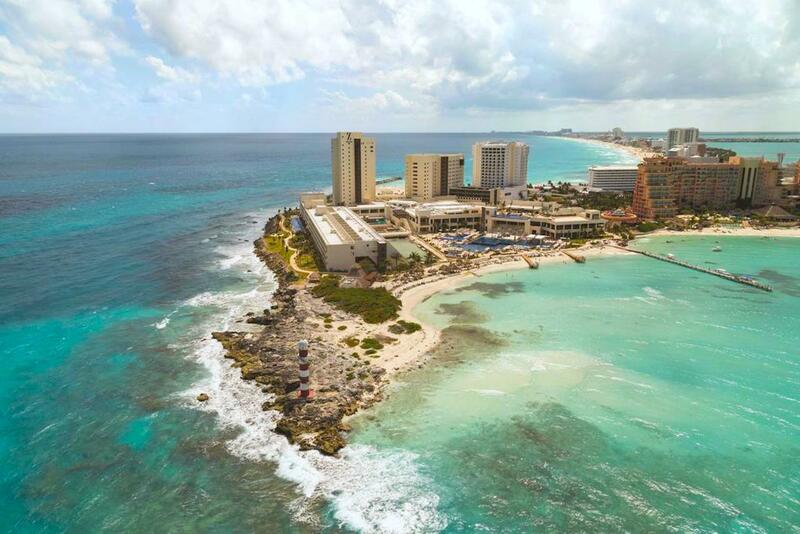 This property is the last hotel within the Hotel Zone of Punta Cancun, which means there is beach everywhere you turn. While there is no reason to really leave the hotel since there is everything you can think of on-site, the location allows you to easily walk to many restaurants and shops nearby. Hyatt Ziva Cancun. Photo courtesy of Hyatt Hotels. 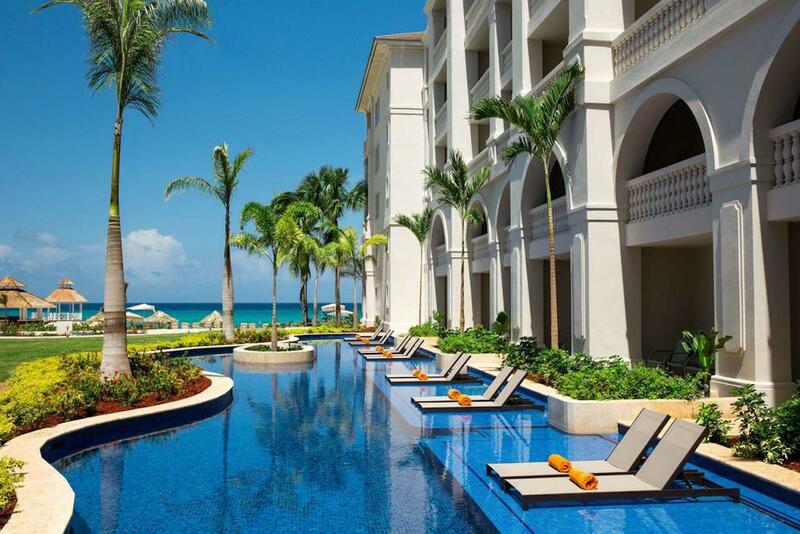 This resort features three infinity pools, two separate beach areas and complimentary pool cabanas. There are a ton of daily activities on the pool deck as well as kayaks, stand-up paddle-boards and snorkeling gear at the beach. There is food and drink every which way you turn with 17 restaurants, lounges and bars. There is truly something for everyone, from sit-down fine dining to your on-the-go food truck. I’ve been to this property twice with my family and they really got it right in terms of food. Your kids will absolutely love the kids club area, which offers many games, arts and crafts, video games, movies and disco parties. There is also an amazing pool area with a few different play structures, slides and waterfalls. While the kids club is for children between the ages 4 to 12, they have scheduled family time where you can take your younger children to enjoy the activities and the pool area. Similar to the Hyatt Ziva Montego Bay, this property also costs just 25,000 World of Hyatt points a night for double occupancy. Kids 2 and under stay for free and any extra adult or child will cost 12,500 points a night. This property will typically always get you a minimum of 2 cents per point on your redemption. 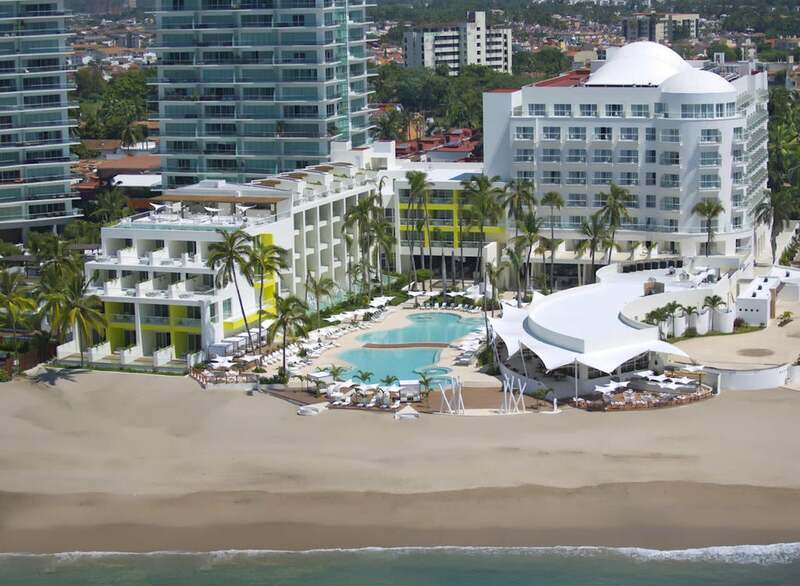 The Hyatt Ziva Puerto Vallarta is located on the south side in Conchas Chinas, which is the quieter side of Puerto Vallarta. This means you will not see as many vendors and outside tourists on the beach and you are only a short taxi ride into Old Town. This hotel includes seven (yes seven!) 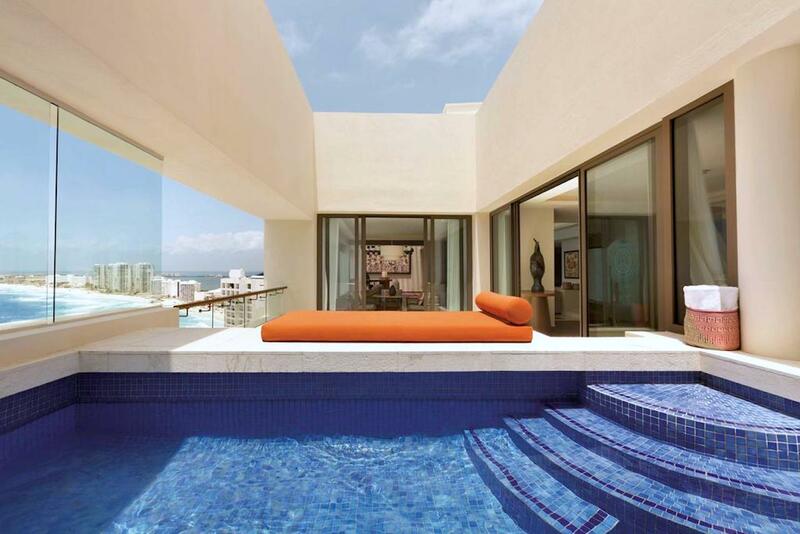 pools — five infinity pools and two kid-friendly options. This means there is a pool for everyone’s desire. Hyatt Ziva Puerto Vallarta pool. Photo courtesy of Hyatt Hotels. What is great about this property is that every single room has an ocean view. Some rooms even have hot tubs on the balcony, and if your kids are old enough, you can ask about staying in one of the swim-up rooms where you can walk right outside your balcony into the pool. As with all Hyatt all-inclusive properties, your mini-fridge is stocked with drinks and snacks — again all complimentary. Room service will even replenish your fridge every single day. Room service is also available for no additional fee throughout the day. Hyatt Ziva Puerto Vallarta room. Photo courtesy of Hyatt Hotels. Families can enjoy the kids club, an oceanfront fitness center, the spa and many food and beverage options. Possibly the best part of this hotel are the food and beverage carts around the property to ensure you are never hungry. Hyatt Ziva Puerto Vallarta spa. Photo courtesy of Hyatt Hotels. 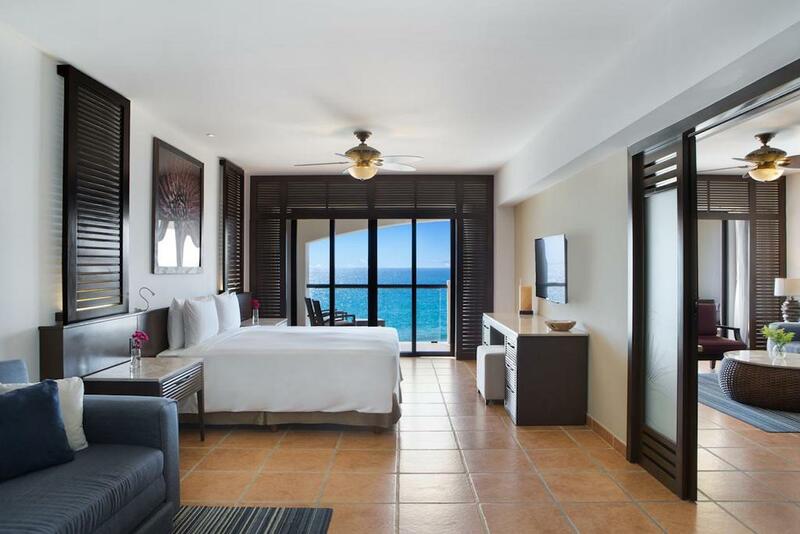 This property only requires 20,000 World of Hyatt points per night for double occupancy, which is 5,000 points less than the Hyatt Ziva Cancun or Hyatt Ziva Montego Bay. This is definitely a steal for this all-inclusive property that can easily be $600 a night during peak times. While kids 2 and under stay for free, additional guests will cost another 10,000 points per night. The Hyatt Ziva Los Cabos is located in the relaxing area of San Jose Del Cabo, which means you are closer to the airport but further away from nightlife. While the property is located right on the beach, which is great beach for building sandcastles — similar to many other beach areas in Cabo — there can be a strong riptide. 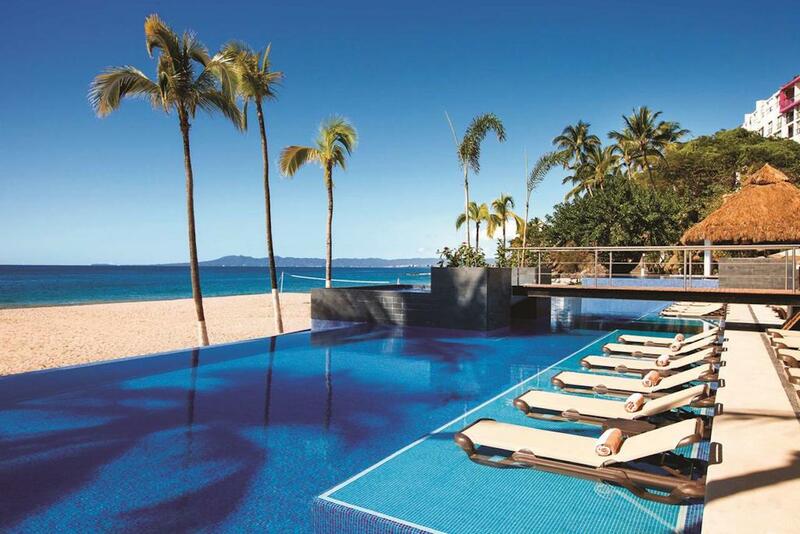 Swimming in the ocean is typically not recommended there, but there is a beautiful infinity pool to splash around in. Hyatt Ziva Los Cabos. Photo courtesy of Hyatt Hotels. The kids club is something you will not want to miss due to many activities inside the club and the pool right outside. The kids club pool includes a mini water park with five slides. There is also a playground with a jungle gym and motorized mini cars. Having a playground at a resort is definitely unique and always a kid favorite. When using points, you can book either their Master King or Master Double, which are large 584-square-foot rooms and even include a pull-out couch. This means there is plenty of space for everyone to sleep in comfort. These rooms also have an outside balcony that is perfect for adults while the kids are sleeping. Hyatt Ziva Los Cabos room. Photo courtesy of Hyatt Hotels. 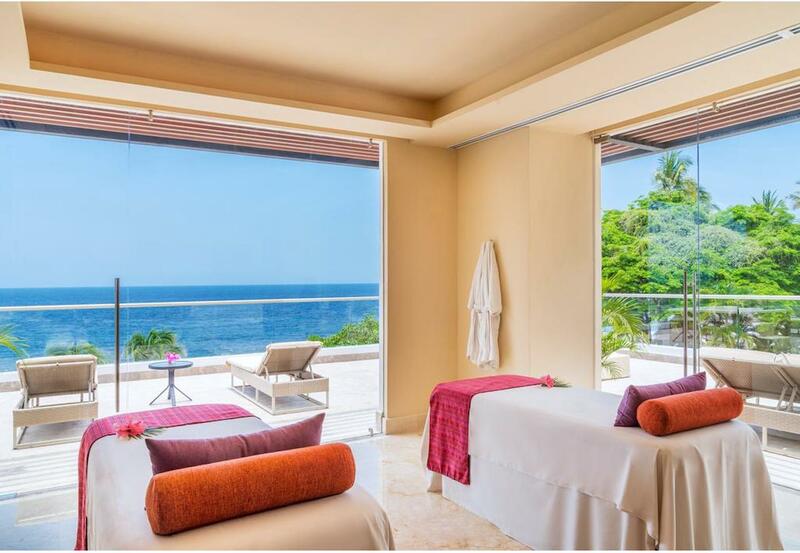 Similar to the Hyatt Ziva Puerto Vallarta, this property only requires 20,000 World of Hyatt points per night for double occupancy. Kids under 3 stay for free, but any additional child or adult in the room will cost 10,000 points per night. Rates at this property seem to be a little less expensive than some of the other Hyatt all-inclusive properties, but it is still an excellent use of your points. The Hilton Puerto Vallarta Resort located on the Bay of Banderas on the West Coast of Mexico is only about 10 minutes away from the airport. While this is a smaller resort, there are still three pools (one adult-only pool) and a beautiful beach. Hilton Puerto Vallarta Resort. Photo courtesy of Hilton Hotels. This hotel features six restaurants, two snack bars and four bars. However, one unique thing about this property is that many restaurants require you to make reservations in advance and have timed dining. They are also not open every day of the week. 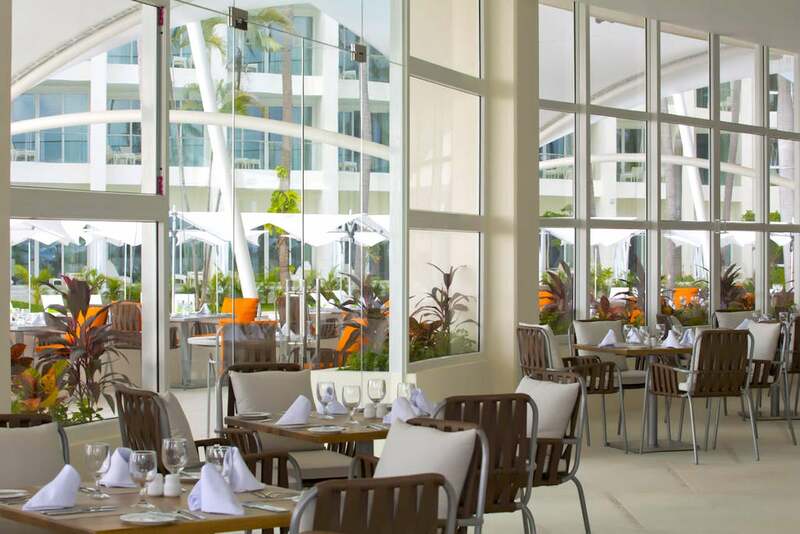 With that being said, there are always a few restaurants available, but your options will not be as plentiful as the Hyatt Ziva Puerto Vallarta. Hilton Puerto Vallarta Resort dining. Photo courtesy of Hilton Hotels. The kids club includes mini-golf, a wading pool, a large movie and game room, and many other daily activities. Typical hours are from 10am to 6pm, but on select weekends they have a pajama party for the kids where they roast marshmallows. The hours are definitely shorter than some other resort kids club and meals are not served (just snacks in case kids get hungry). From the kids club you can hire babysitters for kids starting at just 4 months old at $10/hour per child, which is extremely reasonable for baby-sitting services at a resort. Of course though, during peak Christmas vacation dates, the fees increase. When you use your points at this property you are charged anywhere between 48,000 and 70,000 Hilton Honors points for double occupancy. Single occupancy does cost slightly fewer points, which is useful for those traveling solo, or solo with kids who do not have to pay a surcharge. While some of the features of this hotel definitely do not appear to be as expansive as the Hyatt Ziva Puerto Vallarta, kids 5 and under stay for free, which is huge. Children between ages 6 and 12 are charged $49/child per night. The Holiday Inn Resort Los Cabos is one of the closest beach resorts to the airport, but unfortunately the beach is not swimmable. This seems to be a hit or miss property, although there are two pools (one adult only) and a gym. 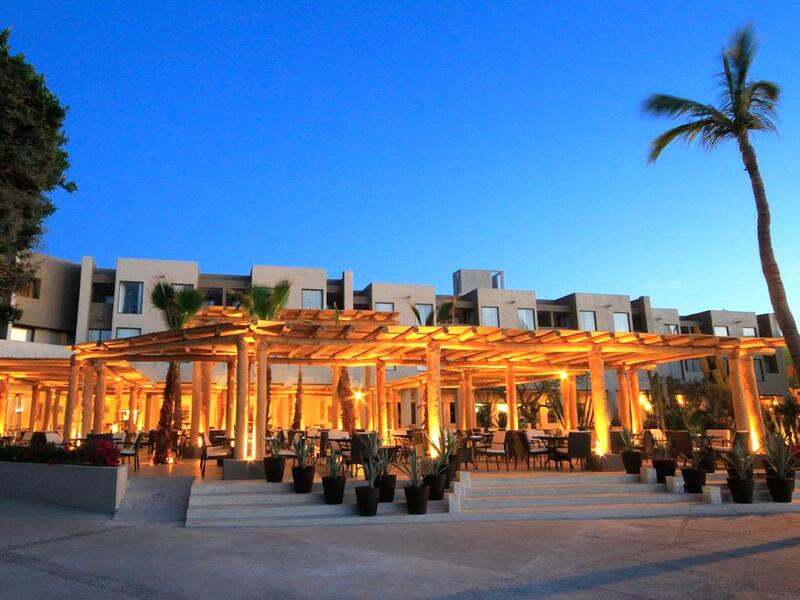 Holiday Inn Resort Los Cabos. Photo courtesy of Holiday Inn Hotels. This property definitely lacks in the restaurant department as there are only two restaurants on-site. On the plus side, there are six bars to enjoy a nice cocktail. The other main difference is that you must be at least 5 years old for the kids club, which is at least a year or two older than many of the other all-inclusive properties. 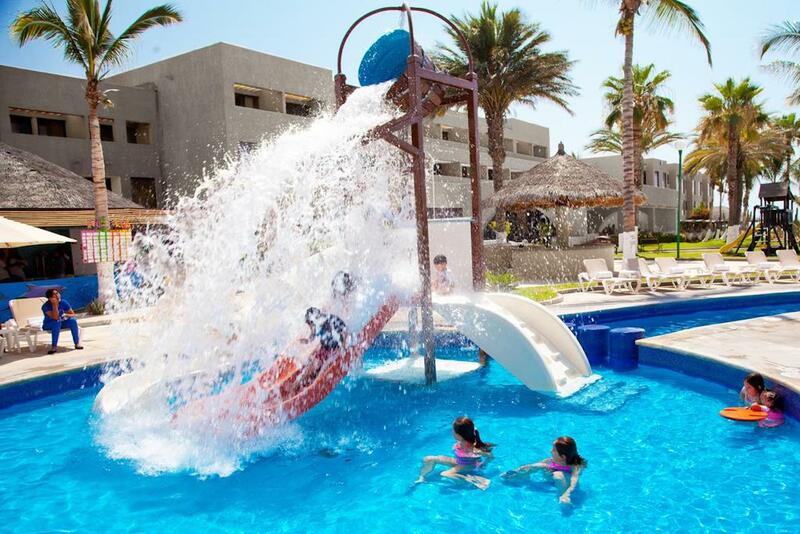 Holiday Inn Resort Los Cabos kids club. Photo courtesy of Holiday Inn Hotels. While this property seems to be lacking in dining and amenities, especially compared to many of the other properties on this list, it only costs 20,000 IHG Rewards Club points per night. This is an incredibly low number of points, although it might be one of those “you get what you pay for” situations. While there are a few other all-inclusive properties where you can use your hotel points for a free night stay, they might not work well for families. Unfortunately, these all-inclusive properties only allow you to reserve a room with one king bed when using your points. While this worked for me while I was traveling a few years ago with a baby who slept in a crib, this definitely will not work now with my 5- and 2-year-old. This will work for some, but could be a roadblock for the vast majority of families. Another option is using your points to redeem for two rooms and asking the hotel for connecting rooms (if they have any). For example, Wyndham has eight all-inclusive properties that are part of the Viva Wyndham group, although only six of them are kid friendly. But, these Wyndham properties can present a good value for families. They include the Viva Wyndham Dominicus Beach (La Romana, Dominican Republic), Viva Wyndham Dominicus Palace (La Romana, Dominican Republic), Viva Wyndham Tangerine (Cabarete, Dominican Republic), Viva Wyndham Maya (Playa del Carmen, Dominican Republic), Viva Wyndham Azteca (Playa del Carmen, Dominican Republic) and Viva Wyndham Fortuna Beach (Grand Bahama, Bahamas). At Wyndham properties, including all-inclusive resorts, you pay a flat 15,000 Wyndham Reward points a night. 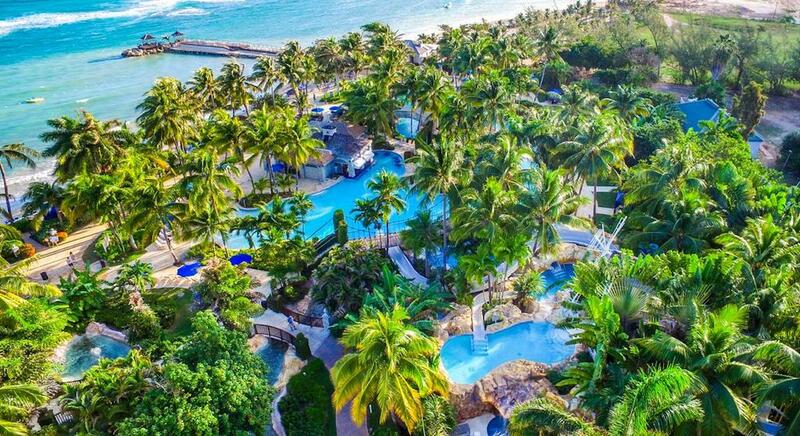 To only have to redeem 15,000 points at one of their all-inclusive properties is pretty generous, but with the one king bed limitation, that might be problematic for many families. Another issue with the Viva Wyndham properties is that almost all of them require a three- or four-night minimum stay when making a reservation. (Only the Viva Wyndham Fortuna Beach allows you to make a one-night reservation.) The issue when using points when a minimum night stay is required is that you cannot pull points from multiple accounts, instead you have to have enough points in a single account. 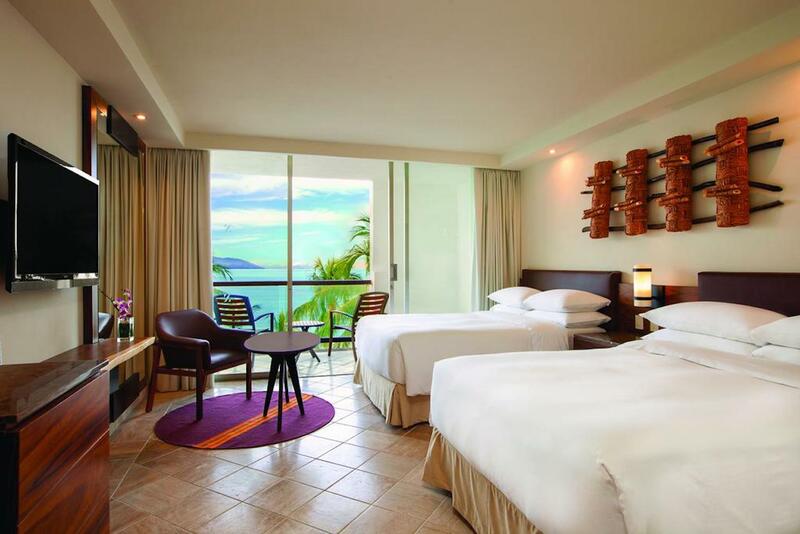 Another example is the Holiday Inn Resort Ixtapa, which is located on Mexico’s Pacific coast. While there are a ton of kid and adult activities at the resort, when you go to redeem your points, it only includes a room for double occupancy and states, “Bed type and smoking preference cannot be guaranteed as it will be allocated upon arrival based on availability.” While you can always book a room (as long as it is refundable) and call the hotel in advance to see if they can allocate a room for you, the system is not automatically set up to allow a family to stay on points so easily. With so many all-inclusive options, it is easy to redeem your points for a truly free stay. If you are going to go the all-inclusive route, I suggest starting to increase your point balance with Hyatt, IHG, Hilton and Wyndham. If I had to pick my favorite though, I’d pick the Hyatt Ziva properties. The brand has done an amazing job providing families with many activities and dining options and the kids club is a huge highlight. It has also priced its properties very competitively by only requiring 20,000 to 25,000 points per night for double occupancy, though once you add a couple of kids aged 3+ to the reservation you are basically looking at the same award price for two rooms as all sharing one. 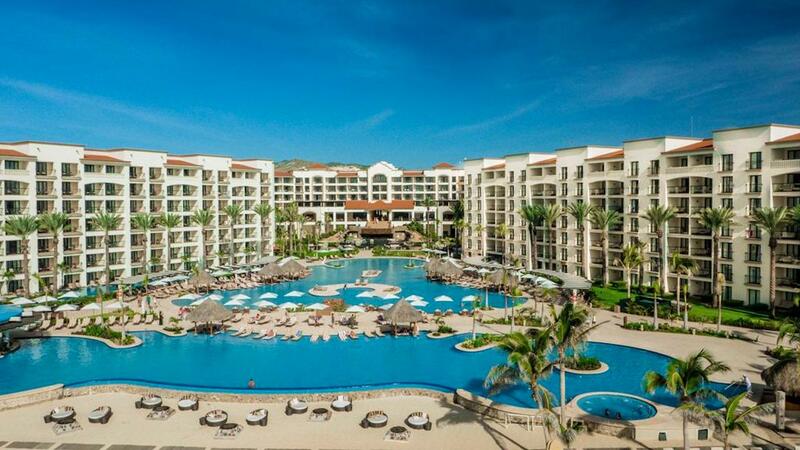 Which all-inclusive resort in the Caribbean or Mexico is your family’s favorite?